Polish online payment-processing service PayLane announces wire-transfer services through Bank BPH, ING, KB Kredyt Bank, BZ WBK, and Getin Bank. The company recently expanded into Germany and is now moving to offer more comprehensive local services. I had a chance to speak with Ula Lachowicz, the brand manager at PayLane, who said that the company believes that services should be tailored to the conditions of the local market. In the case of Poland, transferring money by wire remains one of the most popular online-payment options. She says that, although Polish customers are warming to the idea of using credit cards, they continue to prefer moving money through their local bank. The company already offers services for 9 banks, but is now adding an additional 5 with this latest move. In the near future, they’re planning to integrate additional local wire-transfer options and that they hope to be able to integrate their service with all the major local banks this spring. I’m told that, in addition to local wire transfers, PayLane also accepts PayPal, iDEAL, SOFORT Banking, and Giropay. 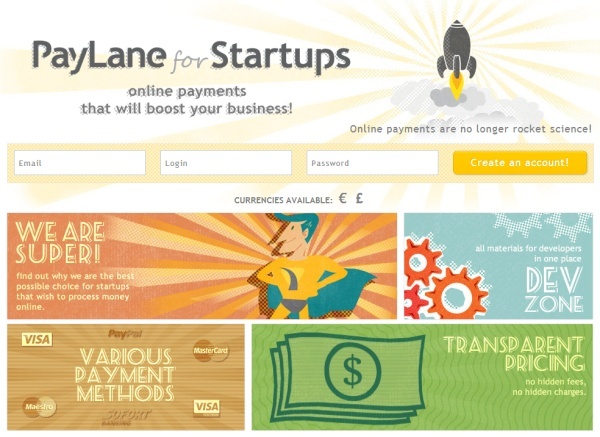 In all, PayLane accepts 160 international currencies. We’ve briefly mentioned PayLane on a few occasions over the past year, but I felt that now would be a good opportunity to really cover the company more in-depth. Therefore, I asked Lachowicz to tell me a bit about them and she replied that PayLane was founded in 2005 as an internal department of Implix, but only in 2011 broke off as a separate company. I’m told that the company does not have external investors and current maintains almost 1,000 accounts. Lachowicz says that they are willing to work with businesses of any size, but that they have a special service for startups. Also, the company offers a special Developer Zone, where developers can find samples of Ruby, Java, PHP, etc. code, so that they can know what to expect from PayLane before signing a contract with them. Recently, PayLane won in the “Best E-Commerce” category at the 2013 The Next Web Poland Startup Awards.